Serious contexts enable ironic content: The „schematic“ as a three-story billboard. and magazine-illustrations of the 1950s and 1960s were precisely described. Step 2: The first rough idea sketch was developed into a positionally precise preparatory drawing. For this purpose, geometrically regular objects were modelled in 3d and rendered in suitable perspective. The 3d models help simulate a design step which, in the 1950s, was done using photos. The style's signature lighting — streaks of light and highlights from artificial light sources — is introduced during the artistic translation. 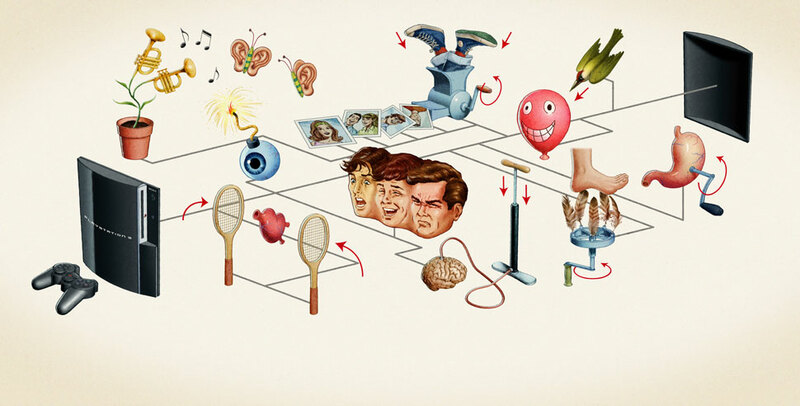 Step 3: All things organic — humans and their body parts — are freehandedly illustrated. Given the right design, even a stomach crank can be assigned to a particular era. Step 4: The actual production process of the 1950s shapes the final look: painting on rough cardboard, the lack of definition and irradiation in the photographic prepress repro, the halftone screen, and the structures of the printed image carrier. Step 5: For an adaption to portrait format, three new perspectives with different vanishing points were constructed and all the image elements fitted accordingly.